Basically, the first render is UE2 with GI enabled, the light intensity at 100%. The colour bounce is what you'd expect. The second is the intensity at 50%, and the colour bounce corrospondingly goes down. The third is still at 50%, but with the Intensity Scale set to 200% so I get all the colour bounce back that I had in the first render. Yes, as explained above that would be exactly as expected since 50% x 200% = 100%. I have a question about UE2. I need to restrict the use of a UE2 light in a illuminance bucle, but I don't know if there is a parameter __category for UE2 that serve for illuminance and lightsource functions in SL. If it there is, Does anyone know what is? Okay, I've read this entire topic over and over and over again, and I STILL don't understand anything;. Mainly, why does the default UE light (and neon light) turn all the objects into black silhouettes? Even when I play around with the render settings and UE light colors, and shading rates, this does not change. Also, what are the diffuse/spec/ambient lights, how do I create them, and why do I need them? This tutorial is INCREDIBLY nice and all, but it isn't basic enough, and it's not cxomplete. Could you please add a troubleshooting & FAQ section to your tutorial for things like this? opal, double click on "!Uberenvironment2 Base" when you have a scene without other lights. Do you still get black silhouettes? If so then there's something wrong. Spec lights are good for (the way i use it) skin shininess or special "effects", like displacement veins or water drops. Just add a distant light and set it to Specular Only. First off in Adam's defense this is ONLY about UE2 and not other lights. If you want to know about Area Lighting try this http://www.daz3d.com/forums/discussion/14536/ which the Neon Light preset is a part of and not UE2. No problem I was just pointing it out to save any more cobfusion. No harm was done. OTish: Yes this is a lot to take in at first and trust me you won't take it all in overnight it will take time and one day it will all fall in to place, if you work at it. I often go back to tutorails months in not years later to refresh the info and once you have done that for a few times it soon sinks in. These younger folks these days can soak this stuff up like a sponge but me I need to drill it in. 4 years later I am happy with what I know and have a serious thrist for more. When people encounter areas in shadows, is it best to go into the Surfaces tab and just adust the specular for that area? And Adam, thanks for the thread. Tutorials take SO much work to do the graphics and explanation- I know this took you days to do. Appreciate you very much. Here's what I am playing with. The first one is with the specular on the OTHER side of my main light (hadn't read this thread.) The second, I moved it WITH the main light as suggested. The problem with the feet can be seen in the second one (the most recent.) Be kind folks, this is my first UE2 render! And I have a lot of complicated lighting that isn't shown- aka, point lights all around her that I have to juggle with the glow. You'll see the green by the chin, the hip area, the arm where it connects to the shoulder- and that was intended. I just didn't want a green alien gal, I want SOME glow. EDIT: changing the specular to the other side wasn't the only change, I also darkened lights but made them darker shades, aka, instead of a lighter pink, I went with a mauve so the skin was more ruddy. uberLight looks for obstructions out to the distance set as (from memory) Max raytrace distance. If it doesn't find any obstruction the light is not reduced, even if it's in the middle of a totally enclosed space. So if I understand correctly, that's how to light an interior room evenly (first) before adding any directional lighting? Yes, optionally with occlusion (shadowing the nooks and crannies) and light intensity and colour controlled by a map to fake the effect of indirect light bouncing off an environment (or indeed with real bounce light, but that's a different mode). Hello, I have been trying to use UE2 IDL setting and DAZ kept crashing when I put G2F HD in the scene. I lowered the quality setting and it would still do the same thing. My hardware is i5 3570K, GTX 660, 16G RAM, ASUS MAXIMUS V. Is my hardware good enough to run or it is the program issue? what I really like to know is: How did you get the distict direction of the directed occlusion in the picture of your post #6 ? What does it depend on to determine the direction and inclination angle? I just figured out how to load the UE2 base into a scene, and that's about it. New is an understatement. 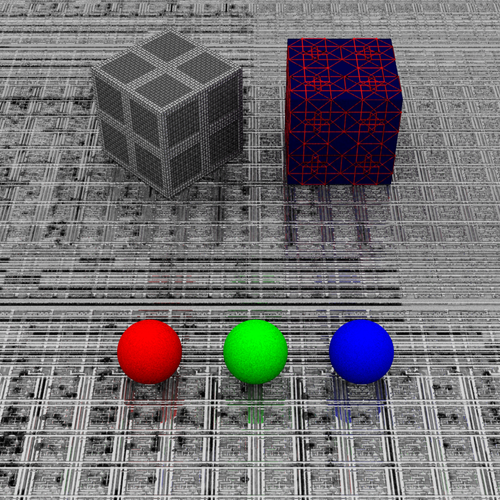 The Default settings don't seam to do spheres justice as there super grainy. Is there a simple set of settings to get basic results that are slightly better then this, for a beginner? Thanks, I see them, and will try them out. I'm guessing they change allot of settings rather then just one. I'm just trying to figure out what one effects the graininess of the sphere the most. The "3Hi" setting is not bad, and that only took about four minutes and change. Max error 0.50, & Occlusion Samples of 64. Max error or Occlusion? hmmm. First you have Occlusion samples which is to control the quality of AO (Ambient Occlusion) AO is non direct light (Ambient Light) shadowing where light doesn't get bounced around much due to either the surface properties and /or the proximity of objects. The closer they together the less light gets a chance to brighten tight spaces. Look at a room light with ambient light (not direct sunlight) see the shadows under the sofa, bed, etc, the shadows between the sofa cushions, all those little subtle shadowing that is Ambient Occlusion. Max Error again lower is better. O.K. I think I got that now. I must have skimmed past that post looking for the "Here is the power switch" one, lol. Turns out that the biggest one for grannie spheres, is the Occlusion Samples. Uber light panels like a setting of 32 min for smooth curves, UE2 needs double that 64 minimum. The rest can stay default, and you'll have reduced graininess. Good thing to keep around for them gray cloudy outside scenes. The value I use for the Occlusion Samples seems to vary dramatically from scene to scene, and on how dimly lit the scene is. I have seen 32 work in one scene, but had to set it to around 1024 for a different scene to get rid of the grainy-ness in the shadows, which slowed rendering WAY down. Don't hesitate to play with large changes in the value, and don't assume a setting you used in one scene is "standard"; you might need to adjust it quite a bit. 1) MaxError is a weird parameter to control (it's not just my opinion, it's from a Pixar Renderman source, and these are, like, the top authority on anything Renderman =)). What it is: an "acceptable devation" from the non-interpolated (aka the slowest) solution, in percent (anyone truly able to visualise what it means?). MaxError's optimum values will vary from scene to scene, too. 3) Combat graininess with samples, "splotchiness" (artefacts similar to high JPEG compression) with irradiance shading rate. But when you raise something, see if you maybe can lower the other or MaxError now. 4) Now this is a cool trick some might not have heard about: The UberSurface shader and its relatives (HSS, US2) have that "occlusion shading rate" parameter (works when setting the shader's Occlusion mode to Override) which is irradiance shading rate per-surface. So you can make it higher or lower per-surface! For instance, when all the scene looks great with a high value like maybe 16, but there are some pesky materials that refuse to lose the "splotchiness" - then lower just their irradiance shading rate, not the global one. Less speed penalty. Again, works for IDL and GI, too. i just set the uberenvironment2 to occlusion w/ soft shadows, and i add 3 distant lights sorrounding the scene. The lights' color and brightness are correspond to the environment map. only the brighter light casts ray shadows . the other 2 are just for illumination and specularity purposes... so does this actually make sense? or at least, qualified as realisitic render settings? That seems like a lot of light to me. 1 distant light ought to be enough for general purposes, and always use shadows on any light (unless its specular only, I guess; but I dislike that practice).